Firewall Analyzer (proxy log analyzer) analyzes logs from a variety of network periphery security devices like, firewalls, proxy servers, IDS, IPS, VPN. Proxy server is typically used along with a firewall or it forms part of the firewall. Firewall is used to protect internal network resources from the external (internet) attacks and the proxy server is used to control and streamline the internet traffic to and fro the intranet. Squid proxy log analysis and reporting gives deeper insight into internal network user's web sites access patterns. Firewall Analyzer processes the Squid proxy server logs to generate exclusive Squid proxy reports. Firewall Analyzer is also a proxy log analyzer. Since Squid proxy server is widely used, Firewall Analyzer (Squid Proxy Log Analyzer) supports Squid proxy logs and hence can provide detailed Squid proxy usage report. Firewall Analyzer fully support (Squid) proxy, firewall combination and as two separate entities. The application acts as a Squid log analyzer and helpful in Squid proxy reporting. The following reports are generated using Squid proxy log analysis. 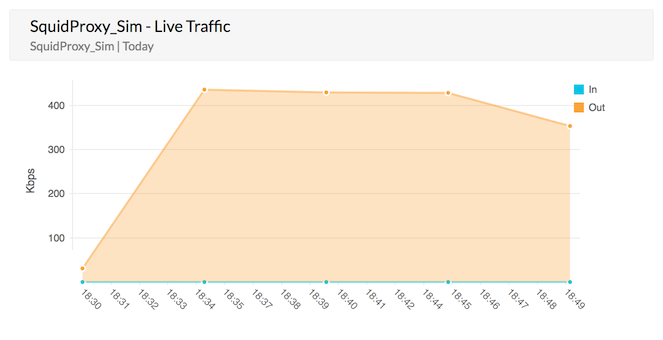 The Live reports for each proxy device shows the minimum, maximum, and average amount of outgoing traffic through that device, over specific time periods. Traffic information is available for the following time periods: last day, last week, last month, and last year, with an average granularity of 5 minutes, 30 minutes, 2 hours, and 1 day respectively. The outgoing bandwidth is displayed in Kbps. Our technical experts are here to help you get the most out of the squid proxy reports. 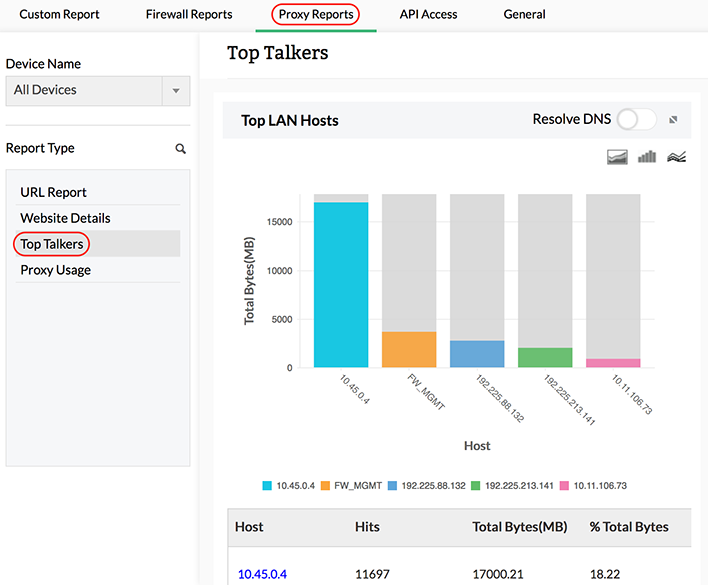 The Top Talkers report shows the top hosts and users generating traffic on both the LAN and the WAN. You can then drill down from each of these reports to see the top web sites, URLs, and more. The Website Details report shows the top domains, web sites, and web pages accessed. you can see more information about each report, such as top users, top URLs, and Squid cache code, by drilling down from each of the graphs. The Squid Usage Summary report shows details on the Squid proxy cache. You can see the top cache codes generated, peer status codes, and HTTP status codes, and also drill down to see more information on hosts and URLs generating the code. Firewall Analyzer provides reports based on URL categories for each Proxy Server. You can get the reports under the major categories allowed and denied URLs. Further, under the major categories, you can get the categories of URLs like social networking, live streaming etc. You can drill down the reports to Top accessed URLs, Top Sources and Top Destinations with number of hits to that URL.